This past Tuesday and Wednesday Outskirts Press introduced the first two finalists in our 2016 Best Book of the Year Awards. Every year Outskirts Press has the honor of publishing thousands of amazing books, and every year we nominate a small percentage of those for submission to the Colorado Independent Publishers Association EVVY Awards. And every year, a percentage of those official nominees win an EVVY Award, thereby representing the best of independent publishing as determined by a committee of 3rd party judges from the publishing community. Our third and final finalist is W. Rosser Wilson, author of Insanity by Murder. Mr. Wilson is a retired surgeon who has turned to fiction writing. Insanity by Murder is his second novel. His first, Otto Danish-American, was published in 2010. The author currently lives in Virginia with his wife and dog. Introducing Insanity by Murder, by W. Rosser Wilson, one of the finalists in the 2016 Outskirts Press Best Book of the Year Awards. As a finalist, W. Rosser Wilson has already won a book video trailer. Take a look! And adding to the mystery of this book…will it win the coveted Best Book of the Year Award and its $1500 Grand Prize? 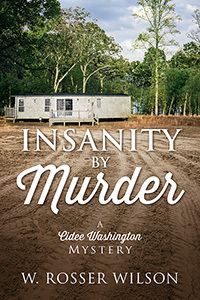 As one of three finalists, W. Rosser Wilson and his book Insanity By Murder will be competing head-to-head-to-head with the other two finalists in a public poll on this blog starting tomorrow, September 9th and going through September 14th. Dr. Wilson has already demonstrated he has the writing chops to win this prestigious award, as evidenced by his EVVY Award win. Does he have the marketing prowess to make it as the Best Book of the Year author in this digital age? Do you think it deserves to win? Order it now to help you decide!